We treat them like family. Sometimes they go to work with us. They take a seat on our couch. And they keep our homes and livestock safer. Yes I am talking about the family dog. And yes, I do buy or make Christmas gifts for the dogs in my life. I also like to give a small gift to my friends dogs. 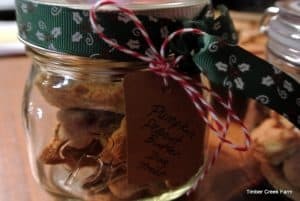 I came up with a quick dog treats recipe that you can make with simple wholesome ingredients. No more worrying about the possible origin of the ingredients in the dog treats you buy. Give this dog treats recipe with confidence. Your friends and family member’s pups should be just fine eating them too. The ingredients in the dog treats recipe are simple. Fresh pumpkin (or canned), peanut butter, dry milk powder, fresh eggs, rice flour, salt and dried parsley. Compare that ingredient list to the listing on the box of your regular dog treats. 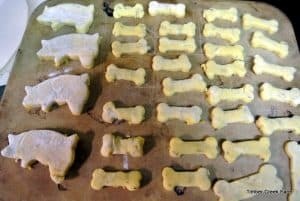 I think you will feel good about making the Pumpkin Peanut Butter Dog Treats recipe. But, remember, even though they are healthy, use these only as a treat and a reward, and not as a regular diet. whisk together eggs, pumpkin puree, peanut butter, dried milk, salt, and parsley. Add the rice flour a little at a time to the mixture. Mix well. A biscuit like dough should form. It will be dry but should be moist enough to hold together. Roll out the dough on a lightly floured surface, 1/4 to 1/2 inch thick. Using cookie cutters or a knife, cut out cookie shapes. Turn cookies over and continue to bake another 20 minutes until desired crispness is reached. Cool completely before feeding the treats to your dog. Ok. 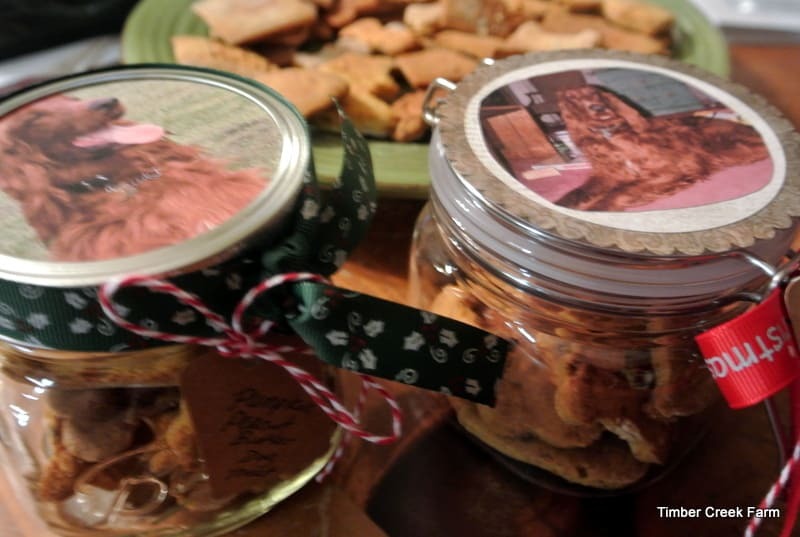 So now that you have the dog treats baked and completely cooled, lets get ready to turn them into a gift. I used two different types of mason jars. To personalize, use a picture of the dog and glue it to the top label area. If using a traditional two piece lid, you can glue the picture to the round label and then replace the canning lid ring. If using a different type of lid system, glue the picture onto the top of the lid. Add a holiday ribbon. Most importantly, add a tag detailing the ingredients so the dogs owner knows how healthy the treat is. I hope you will enjoy making this quick gift for the furry friends in your life. Please share the type of gifts you give to your dog friends in the comments. I’d love to hear what you are doing. Chicken Nesting – Why is My Hen Broody? Dog treats? Sounds good for me, too! 😉 Kudos!! Oh these look good! I might give them a try for my uber pick dog. So far, he doesn’t touch a treat unless they are human grade food – no joke! Our dog is very sensitive to foods and very large. He really is doing well with this recipe. thanks for your comment! I am going to make some of these for Penney, my greyhound! She will love them. 2 Questions though…can I use something other than rice flour AND where to get a bone cutter?? Thanks! I love this! Love the shapes. Too cute! You will be featured on the (mis)Adventures Mondays Blog hop next week! thank you! Will look for it tomorrow! Janet I love this recipe. I’m so using it to spoil my doggies. Thank You. Having the shaped treats are nice but, I save a lot of time by using a pizza cutter and just make the treats into squares or diamonds(I just make parallel cuts all the way across the dough in both a horizontal and vertical direction). My dog love them either way.